A prolific author’s animated ruminations on the risks and rewards of writing. Busch (Closing Arguments, 1991, etc.) is the author of 21 books of primarily fiction. Writing is his calling; he has no choice but to engage in what he sadly observes is a self-indulgent and often ruinous career. 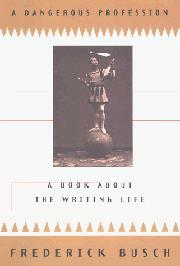 But the very fact that “it costs too much to write,” Busch argues, forces the author to a higher plane of his craft. As he illustrates in these essays on his own career and those of others, salvation from this dangerous profession lies in surrendering one’s passions to developing fictional characters and to pleasing someone other than oneself—the reader. The 16 essays offered here originally appeared primarily in literary or book reviews. They are divided into two parts; one devoted to essays that stem from Busch’s writing life, the other to the writings of others. Busch writes about his personal experience as a writer at various stages of his career, about writers, friends, and family who have influenced his work. The opening essay, “My Father’s War,” reveals memoir-writing at its best and demonstrates, not in argument, but in style what Busch is getting at in these essays. While unified by Busch’s passionate approach, this eclectic collection ranges from reflections on the author’s Brooklyn-based boyhood and early career in New York to a hilarious but serious diatribe on things “bad.” Among the “bad” are the postmodern critics who “do not love anything except the control they exercise in alleging the artist’s uncontrol.” Busch’s essays on other writers include the famous (Melville, Hemingway, and Dickens) and the underappreciated (Leslie Epstein, John O’Hara, and Terrence des Pres). By conveying with passion and insight why a literary work moves him, he excites the reader to read or reread books that have long gone stale in our imaginations. Writing and reading are reunited by an author who, in these essays, shows himself to be a sharp reader, too.